Zymox® Equine Defense® Enzymatic Skin & Coat Wash cleans and maintains a healthy skin and coat on horses. This formula combines mild plant-based surfactants with a patented LP3 Enzyme system to eliminate harmful microbes without the use of harsh chemicals or detergents. This means that the formulation maintains skin and coat health without removing the skin's natural oils. 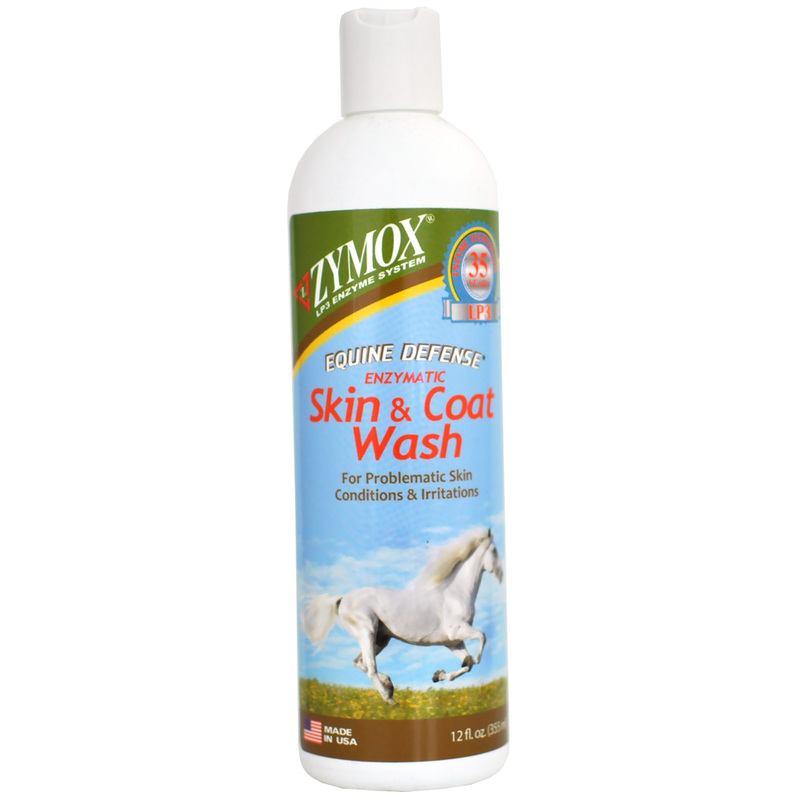 Zymox® Equine Defense® Enzymatic Skin & Coat Wash is made here in the USA and though this bottle includes 12 fluid ounces of the wash, it is also available in 1 gallon containers . For additional protection, it can also be used in conjunction with Zymox Equine Defense Enzymatic Skin Guard as directed. Skin and coat problems can be a real nuissance- so keep your horse healthy with the Zymox Equine Defense System by ordering now! Ingredients: Purified Water, Decyl Glucoside, Lauryl Glucoside, Cocamidopropyl Betaine, Vitamin A, Vitamin B5, Gluconate, Potassium Iodide, Natural Fragrance. Directions: Wet coat thoroughly with water . Apply directly, wash entire animal, concentrating on problem areas. Leave lather on for 3 to 5 minutes then rinse. Repeat if needed. Follow with ZYMOX® Skin Guard for extra antimicrobial protection. For animal use only. Manufactured by Laclede, Inc. for Pet King Brands, Inc. Made in USA.